Here’s an herbal cure for depression that you might not know about. 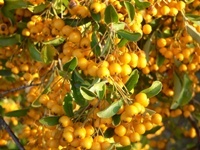 It’s a fruit from a tree that’s native to tropical America: “Byrsonima crassifolia.” These small, sweet, yellow berries are cultivated in Mexico and eaten raw or cooked as dessert. Many Mexicans also include the fruit of the nance, as it’s commonly known, in soups or in stuffing for meats — it’s a fairly common addition to meals. Here in Canada and the U.S., we don’t hear much about nance. But the herb deserves some press coverage, simply for the fact that it may be able to help relieve depression symptoms. Researchers at the Instituto Mexicano del Seguro Social (IMSS) in Morelos noted that nance has been used in traditional medicine for the treatment of some mental-related diseases; however, its specific neuropharmacological effects remain to be defined. The research team performed a study to evaluate the anti-anxiety, anticonvulsant, antidepressant, and sedative effects produced by extracts of nance. The researchers also wanted to study the nance berries’ influence on motor activity. In this animal study, results showed that the nance extract produced an antidepressant effect in mice. However, the researchers cautioned that it doesn’t possess anti-anxiety, sedative, or anticonvulsant properties, as far as they could determine. This is good news for those who are suffering from depression and need a little help. According to the research team, nance contains a number of flavonoids, such as rutin, quercetin and hesperidin, which may be involved in its antidepressant effects. One final note, in case this is the first time you’ve heard about nance and would like to know a little bit more about it. The fruits are often used to prepare carbonated beverages. They are also used to make a fermented beverage known by Mexicans as “chicha.” It may be a little tricky to find nance here in North America, but worth the search if you’ve been looking for a way to boost your mental health. Don’t forget to get your doctor’s advice before taking any herbal medications. For information on another natural remedy that boosts mood, read the article This Natural Remedy Shown to Battle Depression.